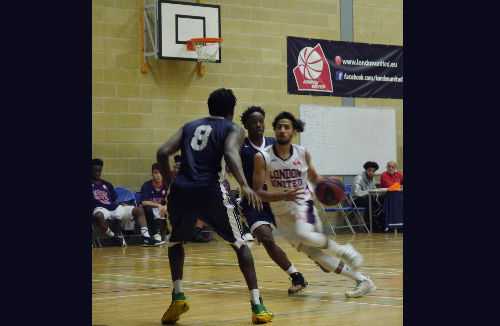 London United Alec Reed Academy started their ABL campaign with a dominant display beating Haringay 6th Form 111-53. At the end of the first quarter there was nothing to suggest that United would overcome their opponents by such a large margin. United led after first the 10 minutes by only 3 points. However, the introduction of full court press had a devastating effect on the Haringay players. A super fast front court of Victor Olareni, Afra Khalil, Daniel Mills and Ellias Poorman caused havoc with their tenacious defence. Haringays’ numerous forced turnovers lead to United’s fast breaks, with many finished with thunderous dunks. The game was finished as an competitive contest after the first half when United took a decisive 55-31 lead. The second half was a very much a carbon copy of the second quarter with United completely controlling proceedings and sailing to victory. Top scorers: V.Olareni 31, A.Khalil 21, D.Golovcenko 16, E.Poorman 15, D.Mills 8, Z.Bentley 8, M. Edwards 3, K. Hines 2, C.Rodriguez 2.